The All Progressives Congress, APC, National Youth Presidential Campaign Council, Ogun State chapter has vowed to deliver two million votes for President Muhammadu Buhari in the February 16, election. The state coordinator of the Campaign council, Olusegun Clement, stated this on Sunday during a press conference held at Abeokuta. Clement said: “Buhari is our man, and we’ll continue to support him, our people know what is good for them and come February 16, Buhari will be victorious in the state. 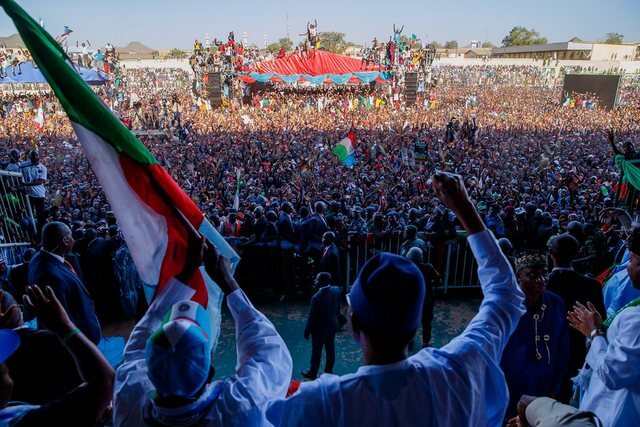 “We have more than 2,500 youths as mechanism, campaigning for President Muhammadu Buhari’s reelection across the 20 local governments in the state. “We are working towards over two million votes for President Muhammadu Buhari come February 16, we shall deliver President Buhari in Ogun State. “Buhari has been a youth-friendly President and has established different programmes to assist and develop the youth across the country”. Speaking on the chance of the Presidential candidate of the Peoples Democratic Party, PDP, Atiku Abubakar in the state, Clement also listed some reasons, he may not be voted for in the state. He said: “Threat to corruption. Before this government emerges, corruption has eaten deep into our dear country to the extent that it is now fighting back which is not healthy for the growth of our dear country. “On Power, Atiku Abubakar has also been accused of being a major supplier of Mikano generator which has been the only alternative to the epileptic power in this country before this government came in, in 2015. “The country was generating less than 3,000 megawatts before 2015, but, since the emergence of President Muhammadu Buhari, we have begun to generate over 7,000 megawatts.